Last weekend, December 3-4, sixteen from our Mindfulness + Compassion program completed Module Two–a two-day silent retreat. In the retreat, we rested deeply into our bodies as we sustained our mindfulness practice, alternating between periods of sitting and walking meditation. We also contemplated impermanence and the inevitability of our own death in ways that opened us to many insights. Many, who were fairly new mindfulness practice, were very surprised in their ability to complete the retreat, both the silence and the physicality of the sitting. And many were struck by how contemplating death could enliven their life today and connect them to their priorities and their faith. By the end of retreat, no one wanted to leave, and each left with a revised or new end-of-life plan with their wishes for caregiving and for after death. To say everybody left happy or peaceful may sound counter-intuitive in terms of how we feel about death and dying in our culture, but we did. Yet, the deepest layer of the retreat for many of us may have been an intimate experience of how death and dying reveals the place of love within and around us. What is the source of love? What will surround us when we die? 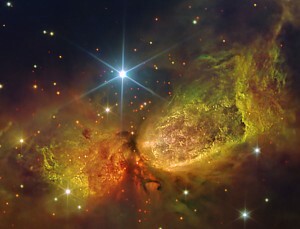 Do we abide in a loving Universe, whether life continues after death or not? Exploring our beliefs, our faith, and perhaps our fears, become important elements of the gifts of death. How do I wish to die, i.e., in a hospice, at home, in a hospital? Do I want others around you or perhaps I wish to die alone? These are questions we contemplated in our retreat. 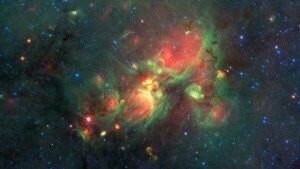 Image taken by NASA’s Spitzer Space Telescope. Another element in our retreat included listening to some evocative readings from Graceful Passages: A Companion for Living and Dying, produced by Michael Stillwater and Gary Malkin. Each reading accompanied by powerful music speaks to us as if we were approaching death’s door. Hearts were cracked open as various spiritual leaders from Christian, Jewish, Hindu, Indigenous, Buddhist traditions and voices from the end-of-life field, including Elizabeth Kubbler Ross and Ram Dass, opened the door to our grief, faith, and to the Mystery that lies beyond this world. These loving words by Lew Epstein, shortly before his death in 2003, had a deep effect on many during the retreat. No one has ever prepared us for this experience. We think it’s the end–no. It’s another beginning. It’s knowing that you’re loved, knowing that you’re loved. It’s not easy, letting yourself by loved–because we’ve learned to judge ourselves–we’re always judging ourselves. But I learned to listen that I was loved. I was loved! And then I would forget that I was loved. Those were the most painful times for me–forgetting I was loved. So you’ve let yourself be loved while you’ve been here. And you judged yourself. And you’ve forgotten that you were loved. And you became alone…but you will always be here. You are blessed. You are forgiven. You are an angel. And you have to listen the you’re loved and you have to forgive all the time. Listen that you’re loved and forgive all the time. You are love. Farewell my son. Farewell my daughter. Farewell my father. Farewell my mother. Farewell my brother. Farewell my sister. Thank you for letting me love you. Thank you for letting yourself be loved. God bless you. Death may in fact be the most important moment of our lives, as many spiritual faiths suggest. Some look forward to this day as a “Returning Home,” but to what? When asked about an afterlife, The Dalai Lama suggested two logical options: either nothingness or another beginning. In either case, he laughs, it is good to have a plan!! Have you? And if you have, does it need to be updated or perhaps it has changed? While some believe “it is always a good day to die,” many of us would be grief-stricken and would struggle to leave our loved ones behind. How can we have a meaningful relationship with this friend that will visit us one day? One way is certainly attending a contemplative retreat that allows us to reflect deeply on its meaning. Our silent retreat included a practice from Roshi Joan Halifax’s, Being with Dying Program, at Upaya Institute, where we considered our best case and our worst case of dying. It’s strange to say that thinking about dying opens our heart to love, to the Mystery, and to what is most important and meaningful to us in living….but it did. Watch out for details of our Contemplative Retreats in 2017!